Scorpion Queen World Record Attempt at Ripley’s. Over the weekend we joined the “media scrum” at Ripley’s: Believe it or not!, located at the Royal Garden Plaza to witness a new Guinness World Record. For 33 days and 33 nights, Khun Kanchana aged 39, otherwise known as “The Scorpion Queen” was released from her temporary glass home at Ripley’s where she has been cohabiting with 5,000 Scorpions. Under the watchful eyes of doctors from the Bangkok Hospital Pattaya, who confirmed she was fit to attend the closing ceremony, Khun Kanchana was released at 2.43pm by Khun Itipon, the Mayor of Pattaya. She was escorted to the official closing ceremony by her Husband who is also known as the “Centipede King”. 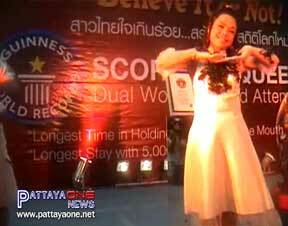 It was confirmed that a new World Record had been achieved and “The Scorpion Queen” was presented with 100,000 Baht from Ripley’s, two return tickets to Koh Samui courtesy of the Tourism Authority of Thailand and a Certificate confirming her World Record as hundreds of spectators looked on. Woman lives with 5000 poisonous scorpions for 33 days!!! "most scorpians only have stings that are as potent as a honey bee sting"
The nastiest one in the US is only 3 centimeters long, and still won't kill you. I'm not sure what the big deal is with this girl. Reminds me of the "Snake Pit" ladies I used to see at county fairs when I was a kid.